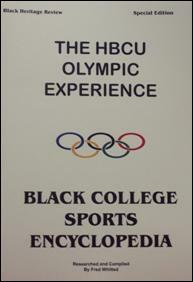 The Black Heritage Review, publisher of the Black College Sports Encyclopedia presents a special edition, HBCU Olympic Experience. This new book details how Historically Black Colleges and Universities contributed to the Olympics, specifically in the area of track and field. It also tells the story of the development of the women’s track and field on the campuses of Tuskegee Institute and Tennessee State University. The book includes a timeline of HBCU contributions and medalists. There are also profiles some of the most outstanding coaches, including the Olympic track coaches from HBCUs. Learn how some coaches worked in other countries before they were allowed to coach for the United States. Also learn about the athletes who were medalists for the United States and other countries. Their common is their participation in the track programs at HBCUs. See how the athletes were developed under tutelage of coaches that developed women’s track and field for the United States. This occurred during the time when most of America thought they athletics was too strenuous for women. This book has been researched and written by Fred Whitted, founder and author of the Black College Sports Encyclopedia. A graduate of Winston Salem State University, he appeared in the documentary Black Magic, which told the history of HBCU basketball. The forward is by George Williams, 2004 US Men’s Olympic Track Team, and, head track coach and athletic director at St. Augustine’s College.